This product is ideal for use in any PCR or RT-PCR application. Tested for prokaryotic as well as eukaryotic genomic DNA contamination that may cause false-positive signals in RT-PCR. 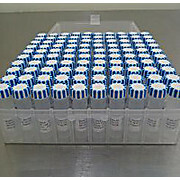 Water is nuclease free and sterile filtered into conveniently sized vials for PCR use.